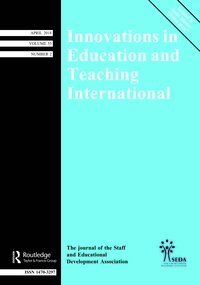 Innovations in Education and Teaching International is the journal of the Staff and Educational Development Association. To this end, contributions to the journal should reflect SEDA’s aim to promote innovation and good practice in higher education through staff and educational development and subject-related practices. IETI has a high impact factor and a long history. It concentrates on papers and reviews on research and professional practice informed teaching and learning, and educational development issues, including innovative teaching and learning strategies and developments in technology-aided education. With contributions from around the world, IETI aims to stay at the cutting edge in the field. Contributions are welcomed on any aspect of promoting and supporting educational change in higher and other post-school education, with an emphasis on research, experience, scholarship and evaluation, rather than mere description of practice. Educational development, also described as academic, faculty, staff or instructional development in some contexts, is taken to mean the activities engaged in by staff in specialist units, academic staff within departments, academic leaders and managers, those involved with quality enhancement initiatives, and others with an interest in educational change, to bring about improvements in, and a better understanding of, policy and practices of learning, teaching, assessment and curriculum development. As an international publication, contributors should both contextualise and consider the transferability of the practices and theories being examined. Innovations in Education & Teaching International is essential reading for all practitioners and decision makers who want to stay informed about the developments in education, teaching and learning. All research articles in this journal have undergone rigorous peer review, based on initial editor screening and anonymized refereeing by at least two anonymous referees. This journal can be found on the Taylor and Francis website. Graham Walton and Catherine Edwards (University of Northumbria at Newcastle) explain what the IMPEL2 eLib Project is and, in the light of the Dearing Report, why its findings are important to all HE teachers. Jenny Rowley (Edge Hill University College) outlines the special problems to be borne in mind when helping students carry out work-based projects. "Tell Me How to Get a First ..."
Katrina Miller (University of Brighton) looks at the misconceptions underlying her students' plea to be shown "how to get a First" - and explores the real meaning of scholarly education. Reg Dennick and Kate Exley (University of Nottingham) describe major changes in the approach of the General Medical Council and some new methods for teaching would-be doctors. Inspiration here for many fields.